A man suffering from depression bounces back to functionality when he adopts a beaver puppet to speak for him. 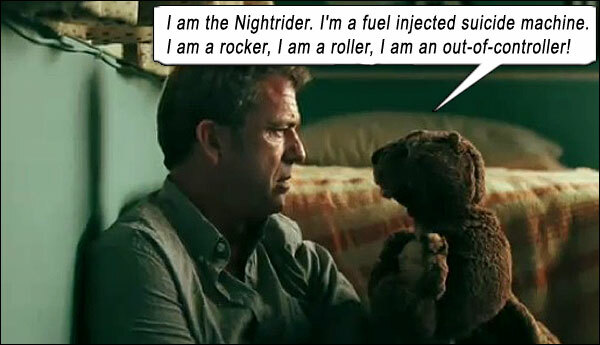 Hmm… can’t tell whether THE BEAVER is a tragicomedy or a psychodramedy… it’s cute, it’s furry, it’s got a big mouth and it’s slightly insane – but enough about Mel Gibson. Jodie Foster (who last shared screentime with Gibson in the breezy MAVERICK, 1994) directs THE BEAVER, a cute and enigmatic tale that should have been Mel’s “comeback” film, rather than the laughable EDGE OF DARKNESS, which did nothing to combat the residue of anti-Semitism, drunkenness and misogyny that Gibson was steeped in at the time. This movie was in production as the media clamor surrounding Gibson’s father, his femme and his faith was at fever pitch, which makes it brave on every front; not just in its storytelling, its antic tone, its excellent performances or its dark arc and darker climax, but for allowing Mouthy Mel to stay attached to the project while his Q rating was sinking lower than Bob Saget’s. On the surface, THE BEAVER is about clinically depressed businessman Walter (Gibson) finding a beaver puppet in a dumpster, adopting it as his alter ego, and speaking through it to his family and employees with a newfound zest. Kids will love the Beaver’s cheeky face that, although expressionless, also seems to exhibit smugness, contempt and malevolence. And adults, well… for those that comprehend the myriad themes and thought-provoking concepts wending their way through the surface comedy, THE BEAVER is a rewarding dambuster. Deeper, where souls go to shrivel and scream, THE BEAVER is a frank exploration of clinical depression; of how one doesn’t have to be at the end of one’s rope, so to speak, to be “depressed”; of how a loving family and a good job doesn’t guarantee happiness. That’s a great new angle – usually, people in movies who want to kill themselves are depressed to begin with; this movie tells us something new – that depression can set in to any normal body, almost like a cancer. The movie also explores how a man can drag himself back from the precipice, only to find himself on another precipice with greater stakes. The movie’s biggest hurdle is its unsure tone, due to its simultaneously cute and disturbing eponymous character. Do we laugh or cower in fear at this rodent stranger? The Beaver – who calls himself The Beaver and speaks in a Ray Winstone cockney (which is Gibson making the voice and working the puppet) – is so funny to look at, and Gibson does such a good job of puppeteering, that we sometimes miss the portent in its words. It’s the concept that SOUTH PARK and other “cute” alter egos exploit – let the cartoon speak the anti-social or politically incorrect message and people will accept it more readily. It becomes almost impossible to shove past the cuteness to the scathing darkness just below the surface fur; it’s not exactly a problem, but it is enough to distract many from “hearing” and “seeing” what the Beaver is truly saying and doing. For example, when Meredith presents Walter with a box full of old family photos, thinking to remind him of the good times and jolt him out of his hand puppet, the Beaver – very funnily – punches Walter roughly and then – very darkly – starts chiding Meredith, “Christ, woman! He doesn’t have amnesia! He’s depressed!” Not only is this another revelation about depression, but the Beaver goes on to describe how infantile Meredith’s efforts are to “cure” Walter. It’s very ominous – but we can’t get over how the Beaver just punched him! Writer Kyle Killen makes The Beaver Walter’s bridge back to reality, but Walter is not coming along for the ride – the Beaver is Walter’s unfiltered id who eventually takes control. The fact it is talking is amusing and endearing, but it is easy to miss Walter himself sometimes timidly trying to break past the Beaver’s stark and sometimes oddly scary behavior (as when it tells Cherry Jones it is not really a puppet, but alive). A recurring accordion lick reminds us of Gilliam’s 12 MONKEYS (1996) and evokes an evil clown trickery; the situation itself evokes MAGIC (1978) with Anthony Hopkins (about a man so dependent on his ventriloquial dummy that it ruins his efforts to woo his sweetheart); the tale inexorably leads to a horrifying climax and bittersweet resolution. Anton Yelchin (STAR TREK 2009) is Walter’s teen son, who hates his dad so much he is trying to flense his personality of all Walter’s idiosyncrasies – there again, some nice thematic meat – but I am not too keen on his subplot of trying to date the hottest girl in school (Jennifer Lawrence). I know it’s meant to play alongside Walter’s situation, provoking nature versus nurture thoughts, and illustrating the effect of a damaged person on their offspring, but it detracts from Walter’s and the Beaver’s amazing character arcs — oh, I get it! Mel has his hand up a beaver, and his son is trying to do the same thing! Starring: Mel Gibson, Jodie Foster, Anton Yelchin, Jennifer Lawrence, Cherry Jones, Riley Thomas Stewart, Zachary Booth, Jeff Corbett.